Why visit Dog Lake? Perhaps to see why it's called Dog Lake. Alas, you'll be mystified; there's nothing remotely doggy about it. It turns out to have been named Dog Lake because in 1898, Robert Marshall of the US Geological Survey visited and found an abandoned sheepdog with a litter of puppies. This seems a trifle irregular and unpoetic, and no doubt Mr. Marshall's heirs regret this and wish that the process could be done all over again, so that it could be named Lake Budweiser instead and they could all be happily retired to the south of France. Though it's possible that the sheepdog and perhaps even her puppies have since passed on, leaving an eponymous void that will never be filled, you can still find a small but pretty mountain lake here, ringed by evergreens and granite mountains, with a strip of meadow at the far end. Scenery Factor: It's not a spectacular lake, but it's still quite pretty, and well worth the short hike. Crowd Factor: It doesn't draw big crowds, but since it's a short hike (albeit a steep one in the beginning), there will usually be other people there. Difficulty: It's a short hike, but the first half is steep, and it's at high elevation. It rates a 4 out of 10. Parking: There's a parking lot at the trailhead, which is also the trailhead for the Lembert Dome trail - and lots of people fit both into the same hike. The trailhead is at the eastern end of Tuolumne Meadows. Nearest Bathrooms: At the trailhead (outhouse variety); restrooms with running water available at the Tuolumne Meadows Visitor Information Center a mile or so to the west. Nearest Snacks: A quarter mile (0.4 km) west of the trailhead at the Tuolumne Meadows Grill & Convenience Store. Food-Storage Lockers: At the supplemental parking area for the Tuolume Meadows Lodge, roughly a mile east. Getting There: From Yosemite Valley, take highway 120 ten miles (16.8 km) to the Crane Flat turnoff onto Tioga Road, then take Tioga Road 40 miles (64 km) east to reach the trailhead at the far eastern edge of Tuolumne Meadows. 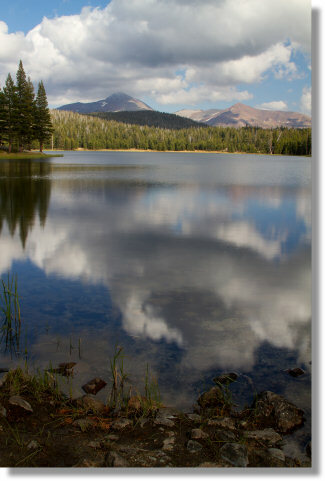 From Yosemite's east entrance at Tioga Pass, take the Tioga Road west 7 miles (11 km) to the trailhead. Here's a Google Street View Panorama of the turnoff to the parking area with Lembert Dome rising behind it.